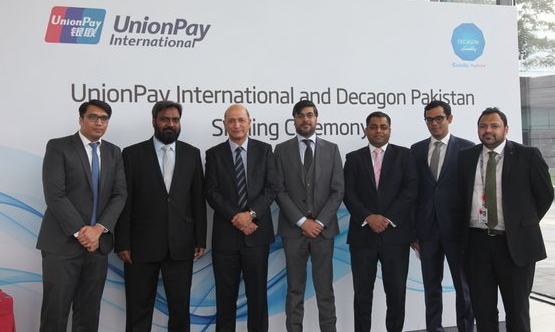 SHANGHAI: UnionPay International, one of the world’s largest payment schemes, and Decagon Pakistan brand Golootlo have entered into a partnership to cooperate to issue UnionPay prepaid and debit cards in collaboration with the issuing banks in Pakistan, offering secure and convenient payment services to the local customers. The two parties will also seek future cooperation opportunities to introduce UnionPay’s QR Code payment mechanism within Golootlo’s merchant network across Pakistan. The partnership was signed by Shuan Ghaidan, Director of Products, UnionPay International and Aziz Kassamali, Chairman, Decagon Pakistan in Shanghai, China. Mr. Shuan Ghaidan (3rd left), Director of Products of UnionPay International and Mr. Aziz Kassamali (4th left), Chairman Decagon signed the agreement. Golootlo is also releasing its proprietary app that will be Pakistan’s first mobile app offering real time and time-sensitive discounts to users. App will include location based services, social networking capabilities and payments options through UnionPay QR codes. Decagon with its joint venture partnership with PayActiv Inc., leading financial wellness platform based in Silicon Valley USA, is also launching PayActiv-enabled UnionPay prepaid and debit cards which are linked to digital wallets and mobile payments through UnionPay QR Code in Pakistan.